The Coastal Plain extends eastward from the Fall Line to the shoreline of the Atlantic Ocean. Sediments deposited since the Cretaceous Period cover crystalline bedrock. The basement bedrock is one billion years old, formed during the Grenville Event when the supercontinent of Rodinia was created. 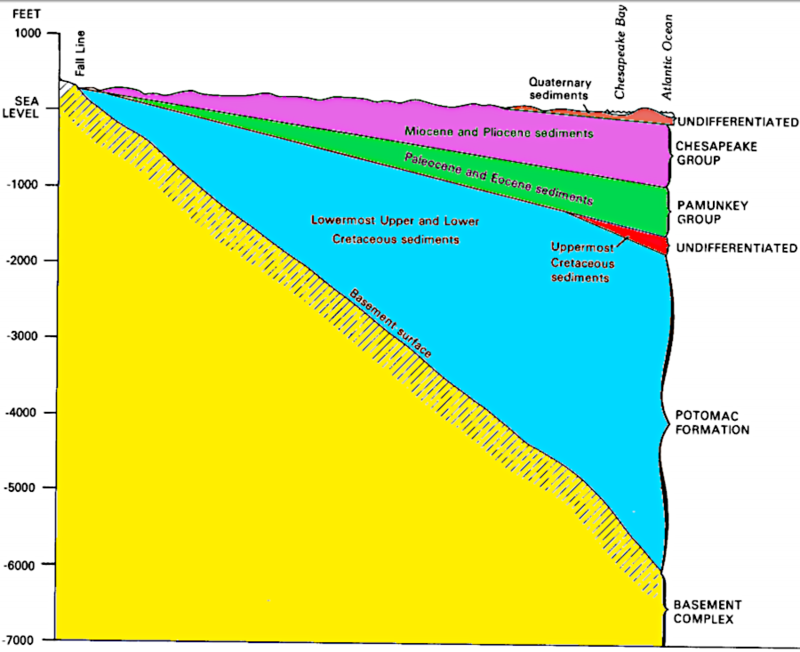 The surface of the Coastal Plain is unconsolidated sediments. Modern construction projects require no blasting; bulldozers and shovels can move the compacted sediments with little difficulty. Native Americans living east of the Fall Line made stone tools from cobbles in the streambeds, since there were no rock outcrops or suitable sites for quarries. The earliest Virginians also traveled and traded to acquire better materials from west of the Fall Line, including hard metamorphic rock from the Blue Ridge and the Uwharrie Mountains now in North Carolina. The sand, clay, and silt were deposited when sea level was higher. Erosion from the Blue Ridge brought sand and clay particles downstream, and at sea level they settled to the bottom of the ocean. Marine deposit also included silica-rich and calcium-rich shells from phytoplankton and zooplankton. Remnants of ocean reefs, sharks teeth, and whale fossils are scattered within the Coastal Plain. Since North America and Africa split apart, sea levels have changed dynamically as tectonic plates and the climate shifted. 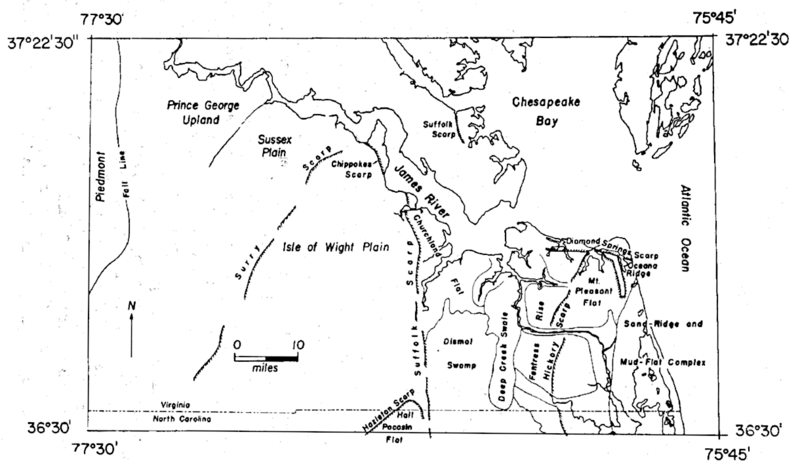 When a bolide (comet or meteor) struck what is now the Chesapeake Bay 35 million years ago, there was no bay. 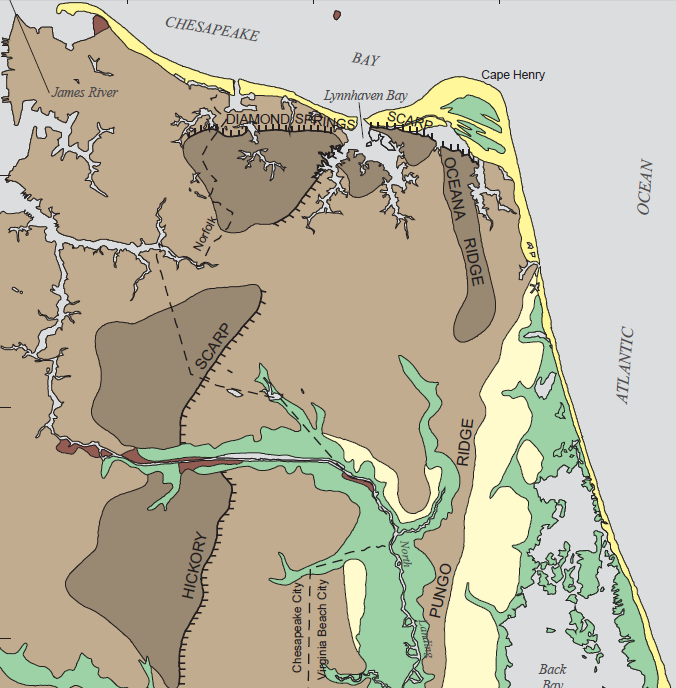 The shoreline was west of Richmond, and marine sediments were accumulating on what is now part of the Piedmont as well as the current Coastal Plain. Many of the sediments which accumulated during high stands of the Atlantic Ocean later eroded away when the sea level dropped. Sediments deposited when shorelines reached furthest west have washed away, exposing the metamorphic bedrock and soils of the Piedmont physiographic province. The edge of the Coastal Plain is where sediments still remain, sitting on top of the same sort of metamorphic rocks exposed further west to the edge of the Blue Ridge. 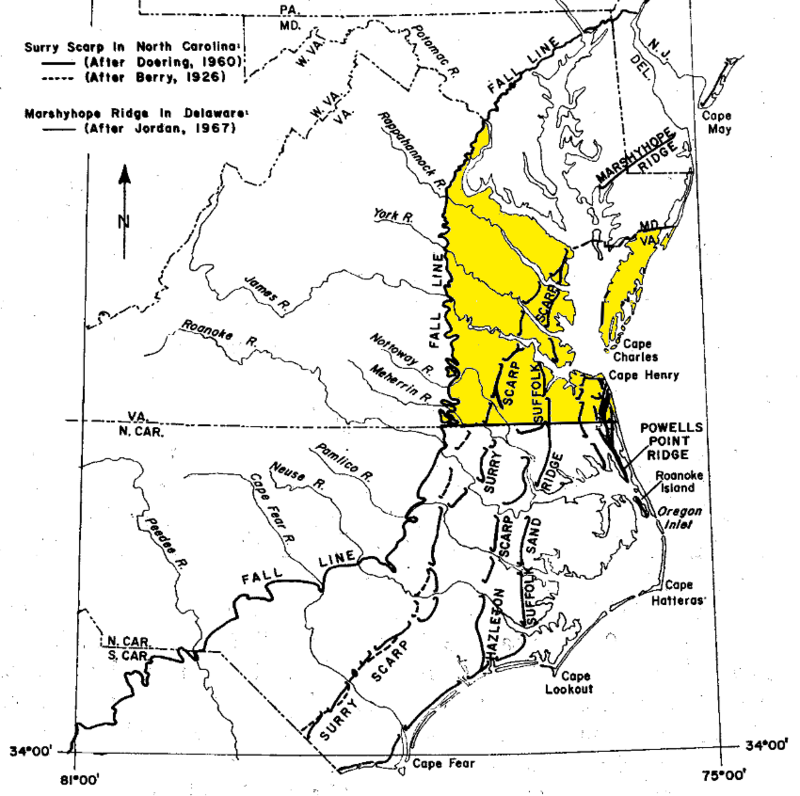 The boundary between the Coastal Plain and the Piedmont is marked roughly north of Petersburg by I-95, and by I-85 south of Petersburg to Raleigh. During the Ice Age, sea levels dropped by roughly 400 feet and Virginia's Coastal Plain extended an additional 40 miles to the east. About 18,000 years ago, sea levels began to rise again, and flood that land. What is now the Outer Continental Shelf is comparable to today's Coastal Plain, with a thin layer of recent sediments on top. The remaining Coastal Plain, between the Piedmont and the modern shoreline, is a flat surface with a very gentle dip from the Fall Line to the ocean. The flatness is interrupted by two topographical features, cliffs and scarps. 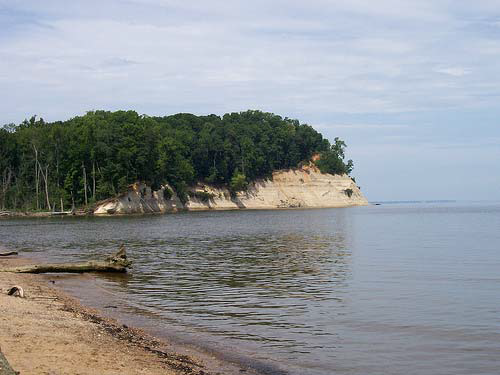 At Westmoreland State Park, the Potomac River has etched a channel with cliffs that expose sharks teeth, whale vertebrae, crocodile bones, and other fossils buried in the Miocene-age sedimentary formations. Beaches directly beneath eroding cliffs there and at Stratford Hall Plantation are closed to fossil collecting because of safety concerns. 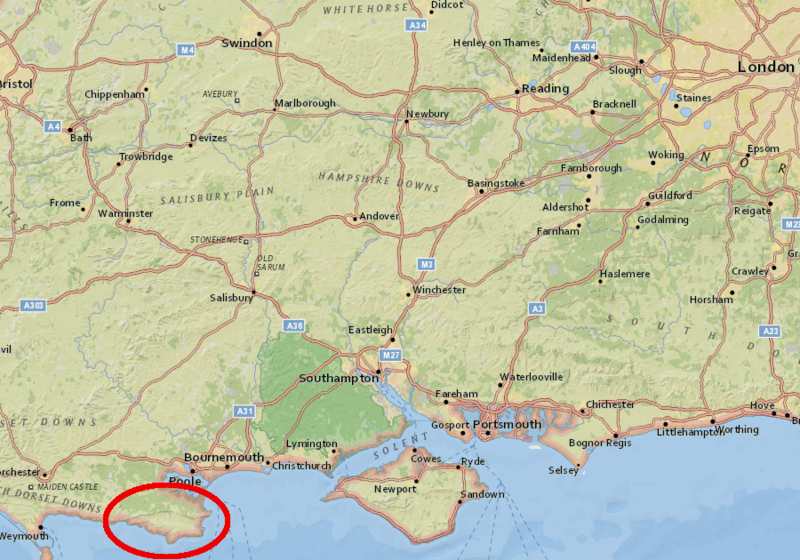 A teenager died in 1975 after a section of the Stratford Cliffs collapsed and the landside crushed him. On the Rappahannock River, the light-colored diatomaceous earth of Fones Cliffs is exposed for four miles on the river's north bank. In 2015, a developer got authorization from Richmond County to build the "Rappahannock Cliffs" golf course and luxury resort. Near the edge of the 75' tall cliff, 22 houses would have spectacular views to the west. The Chesapeake Bay Foundation and other conservation groups opposed the project, noting the environmental sensitivity of the area. 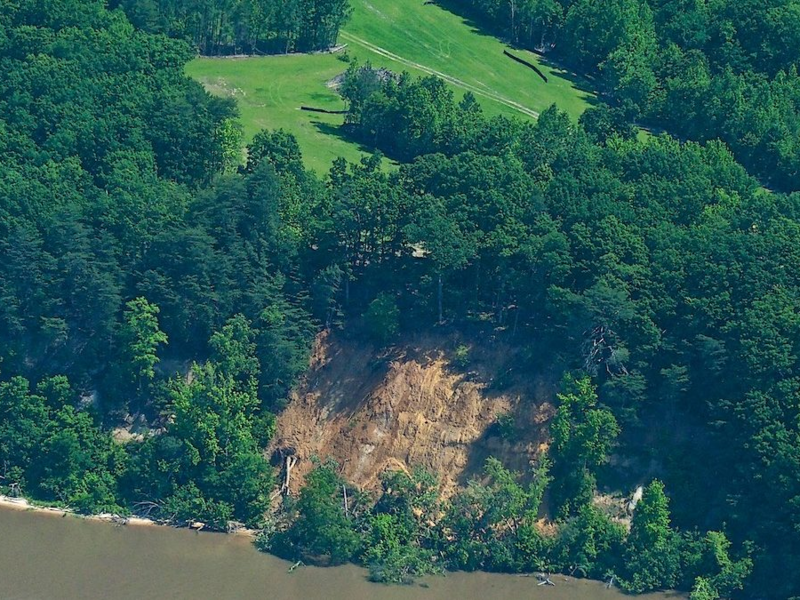 After the developer cleared 13 acres of forested land next to the cliffs for a golf course, but failed to obtain the required permits of install the appropriate stormwater controls, a section of the cliffs collapsed. In response, the state of Virginia sued to block the development from adding excessive sediment to the Rappahannock River. The normal process of erosion had been accelerated by the clearing of the forest above the cliff. Scarps were created by series of sea level changes. The Atlantic Ocean has flooded over and retreated from the Coastal Plain since the Cretaceous Period, when Pangea split up. During different periods of steady sea level, the waves at the temporary shoreline etched into sediments that had been deposited previously and built barrier islands, dunes, and beaches. When sea level dropped later, a ridge of sand was left inland of the new shoreline. is known for its "stair-step" appearance... consisting of wide, gently eastward-sloping plains separated by linear, steeper, eastward facing scarps. Earlier workers called these features, respectively, benches or terraces and scarps or escarpments. The plains are successively lower and less dissected from west to east; thus it was inferred that the higher western plains are older. The plains slope eastward at less than 2 feet per mile, whereas the scarps have slopes of as much as 50 to 450 feet per mile through short distances.